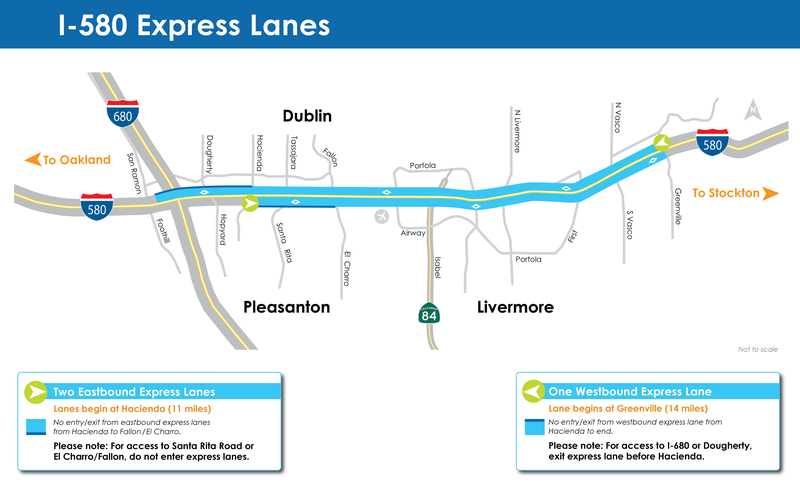 The Interstate 580 Express Lanes will open Friday, February 19, 2016, and Monday, February, 22, 2016, giving drivers a new choice for traveling on I-580 through Dublin, Pleasanton and Livermore. The two eastbound Express Lanes are scheduled to open on Friday, February 19 at 5 a.m., and the westbound Express Lane is scheduled to open on Monday, February 22 at 5 a.m. after final lane striping and overnight removal of all traffic cones. Due to the length of the corridor, each direction requires one night of final preparation work. Final pavement work and opening dates are dependent on good weather. Representing the “next generation” of express lanes, the I-580 Express Lanes will feature near continuous access, so drivers can enter and exit at almost any point instead of waiting for dedicated entry and exit zones, and require a FasTrak® toll tag for all users. Tolls are based on congestion levels, and will be visible on overhead gantries throughout the corridor. The I-580 Express Lanes will be free for carpools, vanpools, clean-air vehicles, buses and motorcycles with a FasTrak Flex toll tag set to 2 or 3+. 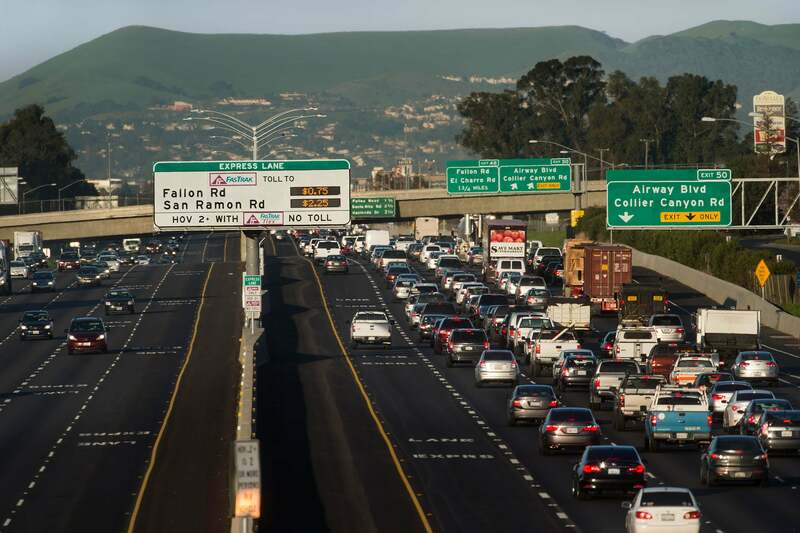 Carpoolers will need to obtain and mount a FasTrak Flex toll tag, a new type of FasTrak tag that allows drivers to designate if they are driving solo or carpooling. FasTrak Flex toll tags can be purchased at Costco, Safeway or Walgreens stores in the Tri-Valley or online at www.bayareafastrak.org. Solo drivers have the option of paying for a more reliable trip with either a standard FasTrak toll tag or a FasTrak Flex set to 1. Toll revenues will be used first to pay for operating and maintaining the express lanes. Remaining funds will be used for additional transportation projects and transit operations along the I-580 corridor, including express buses and other transit service. Operated by the Alameda County Transportation Commission and enforced by the California Highway Patrol, the Express Lanes feature two eastbound lanes and one westbound express lane through the Tri-Valley corridor between San Ramon Road/Foothill Road and Greenville Road. They will operate Monday through Friday from 5 a.m. to 8 p.m. Drivers may enter or exit the express lanes anywhere there is skip striping but must not cross the portions of the express lanes where there are double white lines. Drivers in the westbound express lane need to exit the Express Lane before Hacienda in order to access I-680. A period of adjustment and associated delays are expected as drivers familiarize themselves with the new lanes. Ongoing testing is anticipated during the first weeks of operation. Speeds are expected to normalize as drivers adjust to the lanes. The $227 million project received a mix of federal, state and local funding, including $108 million from Proposition 1B. Since its passage by voters in 2006, more than $18 billion in Proposition 1B funds have been put to work statewide for transportation purposes. The I-580 Express Lanes are specially designed lanes created to improve the commute for all motorists along the approximately 14-mile Tri-Valley corridor in Alameda County through Dublin, Pleasanton and Livermore. The I-580 Express Lanes are operated by the Alameda County Transportation Commission (Alameda CTC) and are funded with federal, regional and local dollars, including an Alameda County sales tax measure. They are part of the Bay Area Express Lanes, a network that will include 550 miles of express lanes by 2035. Get the FasTrak® Flex toll tag if you want to travel toll-free as a carpool, motorcycle, or eligible Clean Air Vehicle (CAV) in the new I-580 Express Lanes. The FasTrak Flex toll tag also works as a standard FasTrak toll tag. It pays bridge tolls, Express Lanes as a solo driver and parking at garages displaying the FasTrak logo. See more info and sign up for FasTrak. MTC is joining with partner agencies to build a network of 550 miles of Express Lanes in the Bay Area. Find out more on the Bay Area Express Lanes page.